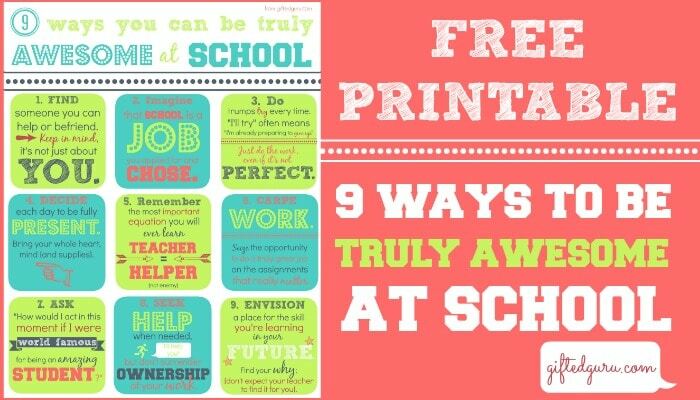 Here are the top nine pieces of crucial advice every student needs to be awesome at school in a free printable. We start with learning to be outwardly focused because if we only think about ourselves then if we’re having a bad day, the whole day is bad. If we focus on others as well, we have more chances for a day to be redeemed. Also, when we focus on what we can give, rather than always on what we can get, we enjoy life more. Tip two is an application of motivation theory. You like it better if you chose it. 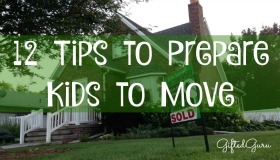 Tip three is basically a paraphrase of Yoda’s “Do or do not; there is no try” adapted for school. 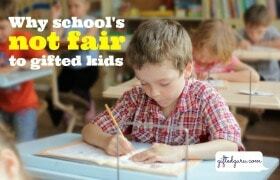 Tip four incorporates mindfulness into the school day. Tip five helps students remember why teachers are there. Animosity and confrontation run counter to being your most awesome self at school (and anywhere, really). Tip six is part of the idea of optimal challenge. Finding meaningful work and then giving it your whole self is rewarding and satisfying. When we feel internally motivated and satisfied, we’re awesome. Tip seven is an application from the Pike Place Fish Market guys who throw fish in a world famous way because they decided to be world famous. Be world famous, even if it’s only in your own small world. In the interest of full disclosure, these guys kept me in teaching because of their incredible attitude. When I met them in person, I cried. No shame. Tip eight acknowledges that no one does it alone, yet we must guard against getting discouraged and saying, “Here, just do it for me.” Finding the delicate balance of control and assistance is a key in acquiring awesomeness. Tip nine invites students to find the relevance in their work. It’s great if teachers do that, too, yet we know best what our dreams are and where the skill we’re learning (whether it’s a concrete skill like algebra or a soft skill like patience) fits in our grand plan. 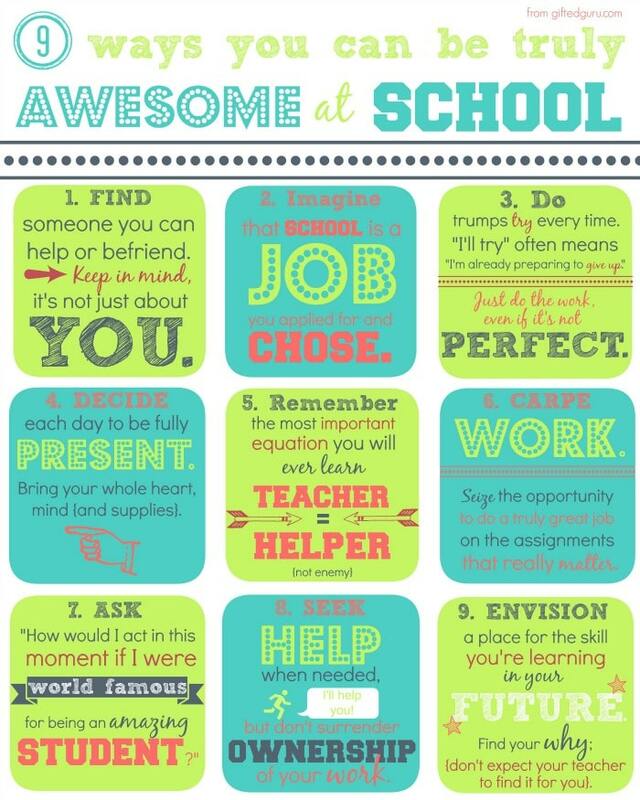 Here’s the full printable sized down, and you can download the printable in full 8×10 size by clicking this link 9 Ways You Can Be Truly Awesome at School. I love this poster, but when I click on the link it won’t download.